Consumer electronics manufacturer Samsung announced the upcoming launch of two new multitouch all-in-one PCs this Tuesday--for the United Kingdom at least. The new slim PCs, which were on show at this years CES, will be offered in 20-inch and 23-inch models. 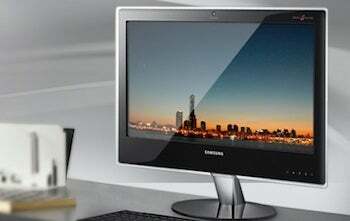 Dubbed the U200 and U250 respectively, the new PCs are Samsung's first entries into the UK home PC market. Samsung was keen to point out that the upcoming all-in-one's slim profile can not only save you space but also serve as a fitting family entertainment hub. The 23-inch U250 rocks full 1080p resolution, whereas the smaller 20-inch U200 has a 1,600-by-900-pixel resolution. Both models will come with Windows 7 Home Premium, Nvidia graphics, 4GB of RAM, a 1.3 megapixel webcam, integrated card reader, and more. You can find the full specifications on Samsung's official site. The two new hands-on computers will arrive in late May in the UK. No price point was revealed and neither was any hint as to when, or if, these new desktops will arrive stateside.